A Culture of Compliance results in a false sense of improved safety performance, because many incidents are driven underground. The official safety numbers may look good. However, the number of unreported near misses and unrecorded minor injuries are indicative of an insidious safety culture. Because the causes are never acknowledged and addressed, they accumulate until a significant event occurs. In a safety context, progressive managers define “strong leadership” as providing clear expectations, encouraging constant improvement, and enabling their employees to succeed. These leaders believe that their principal responsibility is to understand the influences and error traps that may contribute to an injury or near miss. The primary reason these leaders have any safety conversation is because they genuinely care about their co-workers. They realize that process and organizational flaws will only be surfaced and eliminated if there is an environment of trust and mutual learning. These leaders believe that if everyone works together to resolve these issues, tragic events can be avoided. Because they have a caring attitude, these leaders tend to coach when at-risk behaviors are observed. They seek to understand the influences on risk. Safety conversations are focused on collaborating to resolve issues that could lead to an injury. This safety philosophy leads to a Culture of Commitment. If the reason (Why) you have any safety conversation is because you care, the approach will be to coach (How) and seek commitment through collaboration (What). A Culture of Commitment is the foundation for achieving world-class safety performance. Near misses and any injuries, regardless of severity, are reported and thoroughly investigated. Importantly, daily pro-active safety conversations are integrated into every leader’s regimen. This is a culture of learning and improvement. By constantly taking care of the small things, the big events are a rare occurrence. Very few safety cultures are entirely compliance or commitment. Most organizations lie somewhere on a continuum. Leadership is a powerful driver of any safety culture. As such, an assessment of employee perceptions of leadership style can provide key indications of where the organization fits on the safety leadership continuum. This survey instrument (which uses a 5-point Likert scale) also provides detailed insights on each of the leadership dimensions that determine a safety culture. If the SLC score is less than 24, most of your supervisors and managers are using confrontation or control to achieve compliance. They are managing for safety. If the SLC score is over 24, a majority of your supervisors and managers seek contributions from others and collaborate on solutions to seek commitment. They are leading for safety. To paraphrase Simon Sinek, everything starts with your “Why?” The path to zero events requires that leaders understand their crucial role in determining the safety culture. Leadership style sets the tone for the behaviors that follow. 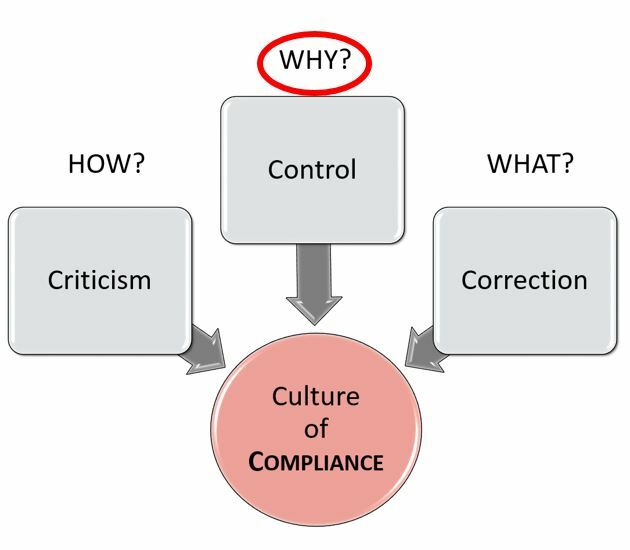 If you want compliance, then manage through control, criticism, and correction. If you seek commitment, then lead through caring, coaching, and collaboration. Start with Why. How Great Leaders Inspire Everyone to Take Action. Simon Sinek. Penguin Group. September, 2009.